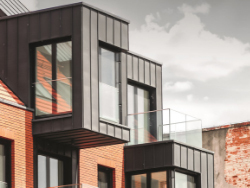 Combining sophisticated style, with extraordinary fire protection, and an efficient installation method, Zintl aluminium cladding system provides architects with an external façade profile that is stylish, low-maintenance and safe. 100% non-combustible, Zintl is certified to the Australian standard, AS1530.1, offering both protection and peace of mind. The interlocking weatherboard profiles are also easy to install, making it suitable for use on a broad range of applications, including residential, commercial, education, sporting and healthcare projects. Available in a wide range powder coated finishes, as well as a selection of anodised and wood grain finishes, architects are drawn to Zintl’s stylish and refined aesthetic. Find the look you want with the stunning Interpon D2525 Commercial Collection. Zintl Futura, Colour Vitality and Flat Matt colour ranges are available via the Interpon Commercial Collection. Developed by the world’s largest coatings company, AkzoNobel, the Interpon collection offers a breathtaking range of design, colour and finish options. And not only will your aluminium cladding look beautiful, you can rest assured it will be durable and long-lasting, thanks to Interpon Powder Coatings use of super durable coatings technology. For an anodised look, choose from the Dulux Premium Colour Selector 2018. Specially selected from Dulux’s Electro range, our Anodised Look colours are designed to subtly change in appearance, as light conditions vary throughout the day. Giving your exterior a uniquely natural finish. All Zintl aluminium cladding profile powder coatings are applied once a project order is confirmed. Application can take up to 10 business days, excluding delivery time on stocked boards. Find out more about our Zintl profiles and colour ranges here. Contact HVG Facades today for more information, or prices on Zintl premium interlocking aluminium cladding system, or request a sample online now. Call 1300 881 712 or email: [email protected].